Joe is a second generation dairy farmer from Jackson County, West Virginia. Together with his wife Rachel, and their four children, they care for about 250 cows and farm 300 acres of corn. 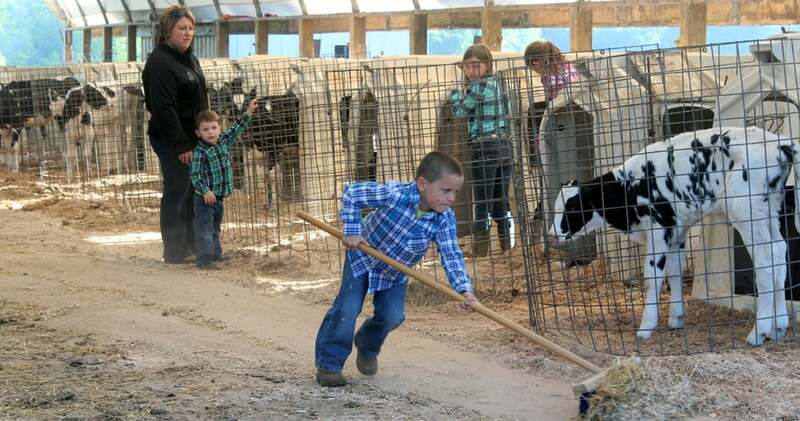 Why did you decide to continue your family’s dairy farming tradition? Joe: My parents started milking cows 30 years ago, when I was in kindergarten, so I grew up around it. When I was younger I didn’t want to do this because it was too much work and too difficult. Then, when I went to Ohio State I fell in love. I got a degree in animal science and later went onto the College of Veterinary Medicine. Then, my wife and I just decided that we were going to come back here and give it a go. I became passionate about dairy farming because we all have to eat. Every day is rewarding, and it’s satisfying to know we are producing high-quality food. Dairy cows are one of the most amazing animals on this earth when you think about it. A cow can turn what she eats into food for others. Milk becomes cheese, butter, sour cream, yogurt, ice cream — just so many different things that consumers want and need. Joe: We have a pasture that our cows can access, but they prefer to be in the freestall barn, where they’re free to go where they want and have stalls bedded with sand. They think they are on the beach every day in the barn! In the summer, the sun starts hitting the cows in the pasture at about 9:30 or 10:00. When cows start to get that morning sun, they come running back in. They want fans. They want misters. They want rubber flooring. They want sand. They want fresh feed and water. The want protection from predators. Everything that the cow wants is here. She likes it. She can hang out with her friends and do what she has to do. The cows are comfortable. They are talking to us in nonverbal ways. What do dairy cows eat? Joe: A cow eats about 100 pounds of feed a day. That’s a lot of peanut butter and jelly sandwiches! We work with nutritionists so our cows eat a balanced ration that includes ingredients like corn, hay, cotton seed and vitamins and minerals, all mixed together. Cows eat about 6-8 meals each day, each lasting about 25-30 minutes. That means cows spend about 3-5 hours every day eating and 15 minutes being milked because we milk three times daily. They are truly only working about 15 minutes out of the day and the rest they can eat, drink and go where they want.